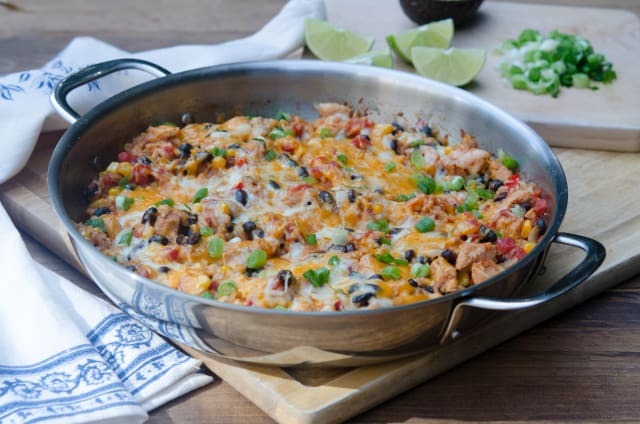 Simple ingredients all cooked together in one skillet create this Tex-Mex Chicken and Rice Skillet. 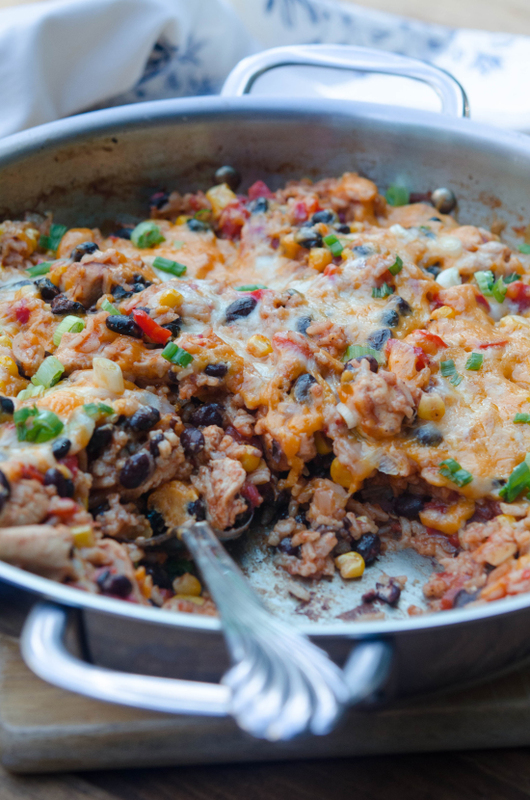 A hearty, delicious, one pot meal for a busy weeknight. We headed up into the hills to the Christmas tree farm on Sunday and ambitiously chose a great, big 12 footer which is now proudly sitting in front of our windows in the living room – sadly, without one measly decoration hanging anywhere on it. There’s just not enough time on the weekends to get all the holiday tasks out of the way so tonight after a simple dinner we’ll pop open a bottle of wine, get the Christmas music going, and decorate our humongous tree. I can’t wait to see all those twinkling lights! Whether it’s decorating, gift wrapping, shopping, or school events, it’s always one thing or another that makes these shorter December days way too long to worry about pulling together a complicated meal. 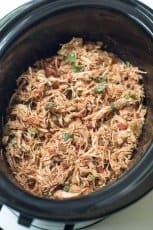 I shared this tasty one-pot meal idea on eHow before Thanksgiving and decided it was the perfect time to tell you all about it. With all the hustling and bustling that will be going on for the remaining weeks of December, quick and easy meal ideas are absolutely in order. 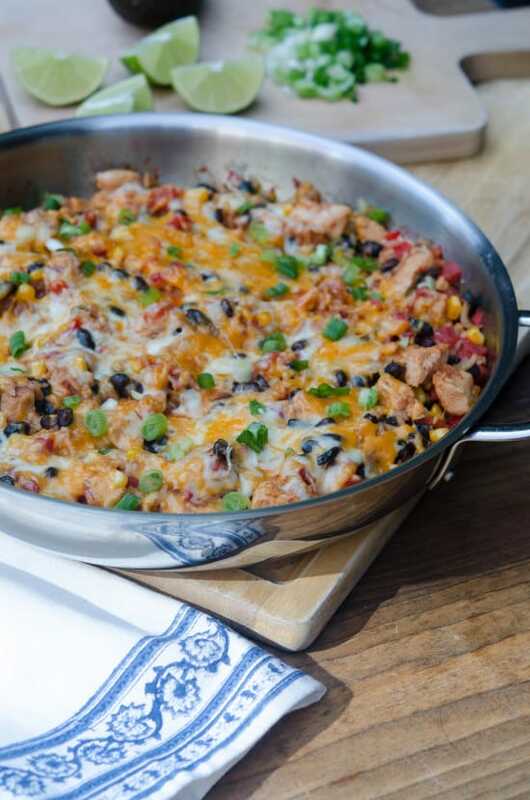 This cheesy chicken and rice skillet with corn, bell pepper, and black beans is a true family pleaser. 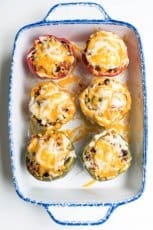 Serve it in bowls with lots of great garnishments like avocado, chopped tomato, sour cream, and salsa and the next day you can wrap the leftovers in tortillas for lunch. It’s on the table in about 30 minutes, give or take and cleanup is a breeze. Heat oil in a 12" saute pan over medium-high heat. Add chicken and season with salt and fresh ground pepper. Cook, stirring frequently, for about 5 to 6 minutes or until chicken is lightly browned. Use a slotted spoon to transfer chicken to a dish and set aside. Add additional oil to pan, if needed. Add onion, red bell pepper, and jalapeno (if using) to pan. Cook and stir for a couple of minutes and then add minced garlic. Cook for another minute or two, till veggies have softened. Add uncooked rice and cook for just a couple of minutes to lightly toast the rice. 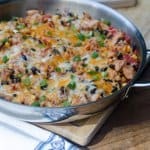 Stir in diced tomatoes, chicken broth, black beans, all seasonings, and the cooked chicken. Bring mixture to a boil, then reduce heat, cover and simmer for 15 minutes. Remove cover and stir in frozen corn. Cook, covered, for another 5 minutes. 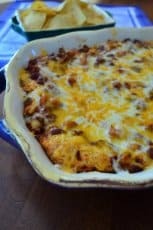 Remove cover and sprinkle cheese over the top. Cover and cook over low heat until cheese has melted. Sprinkle with chopped green onion and serve with optional toppings. It looks soooooo yummy and cheesy! 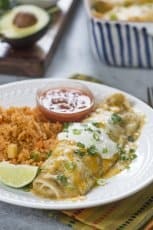 And I love the idea of wrapping leftovers in a tortilla!! How dare you make this and not invite me over. I mean c’mon now. It’s just rude. Hi Donna. I apologize but a Print function isn’t currently available for the recipes on the eHow site. Hi this looks great but one question when do you put the chicken back in?